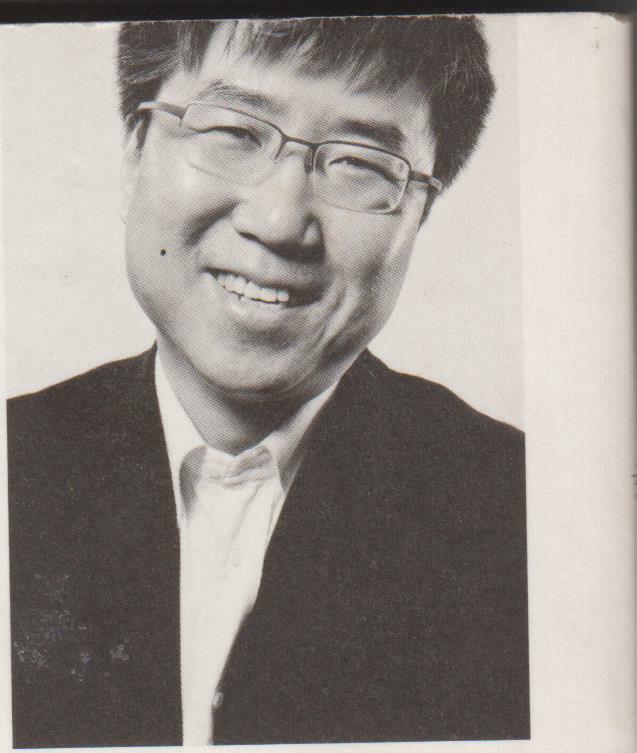 Ha-Joon Chang is a Korean-born Cambridge economist, who has popped up here and there because of his criticisms of Neo-Liberal free market economics. Mike over at Vox Political, for example, has reblogged a meme quoting him on how trickle down economics don’t work, and are merely there to transfer wealth upwards to the rich in the form of tax cuts. 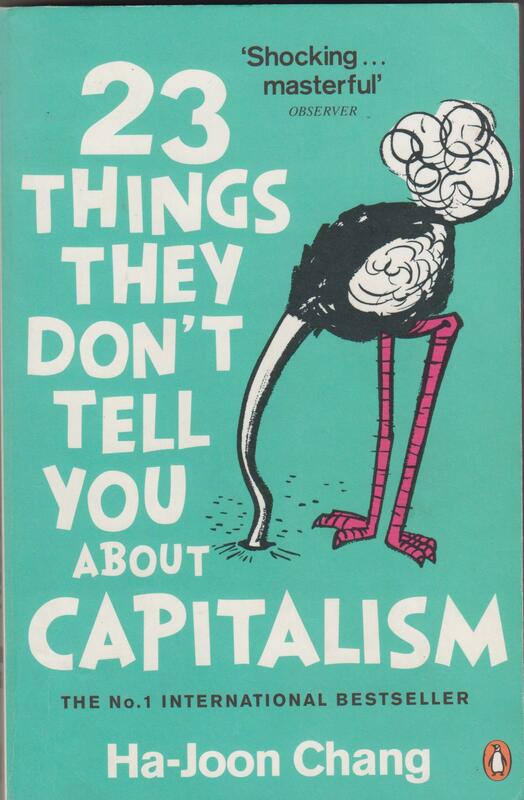 He’s also the author of a popular book on economics and the failings of the free market, 23 Things They Don’t Tell You About Capitalism (London: Penguin 2010). This book is not an anti-capitalist manifesto. Being critical of free-market ideology is not the same as being against capitalism. Despite its problems and limitations, I believe that capitalism is still the best economic system that humanity has invented. My criticism is of a particular version of capitalism that has dominated the world in the last three decades, that is, free-market capitalism. This is not the only way to run capitalism, and certainly not the best, as the record of the last three decades shows. The book shows that there are ways in which capitalism should, and can, be made better. He is, however, very clear on the devastation that has been wrought across the globe by the doctrine of the unrestrained free market. The result of these policies has been the polar opposite of what was promised. Forget for a moment the financial meltdown, which will scar the world for decades to come. Prior to that, and unbeknown to most people, free-market ideologies had resulted in slower growth, rising inequality and heightened instability in most countries. In many rich countries, these problems were masked by huge credit expansion; thus the fact that US wages had remained stagnant and working hours increased since the 1970s was conveniently fogged over by the head brew of credit-fuelled consumer boom. the problems were bad enough in the rich countries, but they were even more serious for the developing world. Living standards in Sub-Saharan Africa have stagnated for the last three decades, while Latin America has seen its per capita growth rate fall by two-thirds during the period. There were some developing countries that grew fast (although with rapidly rising inequality) during this period, such as China and India, but these are precisely the countries that, while partially liberalizing, have refused to introduce full-blown free-market policies. Thus, what we were told by the free-marketeers – or, as they are often called, neo-liberal economists, are at best only partially true and at worst plain wrong. As I will show throughout this book, the ‘truths’ peddled by free-market ideologues are based on lazy assumptions and blinkered visions, if not necessarily self-serving notions. My aim in this book is to tell you some essential truths about capitalism that the free-marketeers won’t. Which is more than enough to give the late Mrs Thatcher a fit of the vapours. Chang states that his goal is to empower people to make decisions and have opinions on these issues, whereas they might otherwise leave them to the experts on the grounds that they don’t have enough technical expertise, and so become active citizens demanding the right course of action from decision-makers. Thing 1 There is no such thing as the free market. Thing 2 Companies should not be run in the interest of their owners. Thing 3 Most people in rich countries are paid more than they should be. Thing 4 The washing machine has changed the world more than the internet has. Thing 5 Assume the worst about people and you will get the worst. Thing 6 Greater macroeconomic stability has not made the world any more stable. Thing 7 Free-market policies rarely make poor countries rich. Thing 8 Capital has a nationality. Thing 9 We do not live in a post-industrial age. Thing 10. the US does not have the highest living standard in the world. Thing 11 Africa is not destined for underdevelopment. Thing 12. Governments can pick winners. Thing 13 Making rich people richer doesn’t make the rest of us richer. Thing 14 Us managers are over-priced. Thing 15 People in poor countries are more entrepreneurial than people in rich countries. Thing 16 We are not smart enough to leave things to the market. Thing 18 What is good for General Motors is not necessarily good for the United States. Thing 19 Despite the fall of Communism, we are still living in planned economies. Thing 20 Equality of opportunity may not be fair. Thing 21 Big government makes people more open to change. Thing 22 Financial markets need to become less, not more, efficient. Thing 23 Good economic policy does not require good economists. He also makes seven suggestions how you can read the book, to answer certain queries, reading selected chapters to answer such questions as what capitalism is, or if you think politics is a waste of time or if you think the world is an unfair place, but there isn’t much you can do about it. And while the book isn’t an attack on capitalism itself, some of the solutions to its problems do involve an element of Socialism or worker participation. For example, in the ‘Thing’ about why companies should not be run in the interests of the people who own them, Chang points out that the ownership of a country by shareholders means in practice that these have less interest than traditional owner managers in it being profitable or viable, as they can always take their shares out and put them somewhere else. As a result, the countries which have some of the most stable, and hence, most profitable companies, are those which have encouraged long-term investment or encouraged their workers to have a stake in them. Such as France, where several companies are part-owned by the state, or Germany and Austria, which have a degree of worker’s control through works’ councils. It’s a fascinating and very necessary critique of the free-market capitalism beloved by the Blairites in Labour, and the Tories. Economics is notoriously the ‘dismal science’, but this is well and engagingly written for the ordinary reader, and I hope it encourages more people to criticise and bring down this deeply flawed and iniquitous system. Mike over at Vox Political has a very interesting piece from the BBC. The leaders of the Conservative, Liberal and Labour groups in the Local Government Association have written a joint letter to the Observer, stating their opposition to the government’s plans to turn all schools into academies. The stats actually demonstrate that all academy schools actually perform worse than the schools under state/ local government control. There’s also a graph with the article that demonstrates this. Mike asks the obvious question of why, if Academy Schools are so poor, are the Tories so keen to convert all our schools into them? Is it because they don’t want an educated, critically-thinking electorate, but indoctrinated drones that will take low-wage jobs because they lack the qualifications for anything else? Or is it because they know that everybody else’s children are more intelligent than they are, and can’t handle the competition? My guess is that the Tories are keen on privatising our schools for a number of reasons, not excluding those Mike has outlined. They firstly want to privatise them for the economic profit of their paymasters in big business, including one Australian-American media mogul, Rupert Murdoch, who also has an educational arm to his business empire. I think it’s called Aspire, rather than something more suitable, like ‘Despair’. Secondly, it’s carrying on from Thatcher’s campaign to create a class of schools removed from local authority control. Like Mussolini, Maggie Thatcher is, to the Tory faithful, always right. Anything she does cannot be criticised in any shape or form and is absolutely correct, whatever happens. To quote the old scientist, it is very much a case of where there’s a difference between theory and reality, so much for reality. Thatcher was basing her campaign against state education, and more broadly, teachers, on the popular resentment in the 1970s and ’80s about teachers from the ‘loony Left’ indoctrinating children in state schools, teaching them that gays were equal and making them anti-racist, when they should instead have been teaching them good, hearty Tory values. Remember the clause in her education bill attacking the teaching of homosexual propaganda in school? And I can remember her also delivering a foam-flecked rant to the Tory faithful about how ‘Fabians’ were teaching children ‘anti-racist mathematics’. At the time, there were concerns about the failures of those schools which had adopted ‘progressive’ educational policies. Like one school in inner London, where the teachers decided not to teach, as this would ruin children’s innate creativity. There were also horror stories run in the press about Brent and Lambeth councils, and the bizarre, highly authoritarian attitude they took to education, in which nearly everything was suspected of racism. They were supposed to have altered the old nursery rhyme, ‘Baa, Baa, Black Sheep’, to ‘Baa, Baa, Green Sheep’ to make it less racist. It’s been stated several times since that this was just an urban myth, and that the Sun has admitted it made it up. On the other hand, I’ve met people, who did go to school in those boroughs, who claimed they did have to sing it. So I honestly don’t know. Given the mendacity and racism of the Scum, it wouldn’t surprise me if they had made it up. Thirdly, there was and is a strong perception that comprehensive education, which was mostly introduced by Labour, but which also had some Tory support, had failed, and that standards had fallen. The older generation in particular looked back to the grammar schools with nostalgia as institutions where standards were much higher. It looked very much like Thatcher was using this nostalgia to try and reintroduce them, albeit in a slightly different, updated form. In actual fact, the Labour party under Crossland had decided to introduce comprehensive schools because the grammar schools were elitist. Very few working-class children were sent there. Instead, they were considered more suited to the secondary moderns, where they would be taught a manual trade. Grammar schools were reserved for those set on clerical careers and the like, and so were very much bastions of the middle classes. There were immense problems with some of the comprehensives. Some of them were too large, too underfunded, and hampered with the kind of teaching staff that have become stereotypical amongst the Right. Hartcliffe, one of the comprehensive schools in my part of Bristol, had an unenviable reputation for poor academic performance, and chronic theft and bullying amongst its pupils. It has changed greatly since then. It’s been divided into two buildings, rather than a single huge one, and standards have risen markedly in the past few decades with a change of headmasters. My guess is that the changes that occurred to Hartcliffe, have also been common amongst failing schools throughout the country. Standards in state education have risen. But this counts for nothing, as the Tory Right is ideologically opposed to state education. Tory toffs like Cameron, Gove, Osborne and Thicky Nikki seem to look back for their view of a good education system to the late 19th and early 20th centuries, when schools, or at least, the grammar schools, were largely private, and the proles were given just enough education to allow them to get a job once they left school, which was at 12, then 14. Changes in industry mean that you now need a more educated, technically proficient workforce, and so they can’t get away with sending children that you out to work. So the higher education sector has expanded, but the Tories would like that to be the nearly exclusive province of the monied classes, and so have raised tuition fees to exorbitant heights after they were introduced by Bliar. And so contemporary schoolchildren are going to suffer because of a political orthodoxy that started with Maggie Thatcher in the 1980s, and has continued through a mixture of greed and ideological inertia. Oh yes, and the Goebbels-like determination to keep pushing a good lie if it gets you votes. More information can be read at Mike’s blog at http://voxpoliticalonline.com/2016/03/12/more-than-24-billion-has-been-taken-away-from-disabled-people-to-support-tax-cuts-for-the-rich-who-dont-need-them/. The title of Mike’s piece has the rhetorical question whether the £24 bill taken from the disabled is to fund tax cuts for the rich. Considering how the government is shifting the tax burden from the rich to the poor, I really don’t think there’s much doubt about it. I found this piece in Private Eye for the 15th-28th November 2013 reporting the questioning of representatives of the arms trade by a parliamentary committee in that issue’s ‘Called to Ordure’ column. It’s still relevant now, after nearly three years, because of the way we are still selling arms to brutal, anti-democratic regimes like Saudi Arabia. Please don’t call them “missiles” or “landmines”, and certainly not “tools of military repression”. They are, according to the arms trade, “goods”, and the foreign regimes that buy them are “the ultimate end users of the goods”. So heard MPs more than once when Westminster’s arms export controls select committee took evidence from four “defence exporters” (to use another euphemism). Unofficial leader of this genteel quartet was middle-aged Brummie called David Hayes from the Export Group for Aerospace and Defence, a trade lobbying group which uses the acronym Egad. Egad, indeed. Alongside Hayes: arms-trade consultant Michael Bell; Susan Griffiths from weapons manufacturer MBDA; and Bernadette Peers, from the Strategic Shipping Company, a company name so bland you might believe it was exporting nothing more dangerous than cauliflowers to the Canaries. MPs noted that government reporting on arms dealers has been reduced, Whitehall’s Export Control Organisation (ECO) now doing only an annual report of statistics instead of the quarterly updates it used to offer. The people from Egad were breezily unconcerned by this, insisting it made no difference. Hayes said there was a “very, very low risk” that less frequent reporting of special arms-sale licences wold be detrimental to transparency. Three critics of the arms trade also gave evidence. Roy Isbister, from conflict-reduction group Saferworld, said that the reduction in ECO’s reports had come as “a bombshell”. You can say that again, Roy. Several bombshells, really, packed and ready for shipping. Oxfam had sent along one Martin Butcher. With that surname, shouldn’t he have been on the other side of the argument? Committee chairman Sir John Stanley (Con, Tonbridge & Malling) wondered if the arms dealers were concerned about “extra-territorial” prosecutions, under which a British arms trader may be guilty of wrongdoing if he or she breaks British law while abroad. Bell was most aggrieved by this. “We have reservations of principle!” he declared, this peddler of munitions with a highly-tuned sense of ethics. Extra-territorial prosecutions meant that a business executive would be “subject to two jurisdictions for the same actions” and that offended Bell’s strong sense of morality. Bell also had “reservations of practice” because “the only people who suffer are the compliant”. Richard Burden (Lab, Birmingham Northfield) noted that the United States had recently relaxed its arms-trade licence requirements, meaning US weapons manufacturers can now export pretty much willy-nilly to 36 countries where they would previously have faced greater government checks. Hayes argued that with one of these countries being Turkey, “American exporters are at a clear advantage over UK exporters”. Western government might want to beware, because it was hard to know who would be “the ultimate end user of the goods” in an arms deal. Interesting to hear an arms trader make this argument; it is usually heard from the peaceniks. Bell pointed out that one of the countries covered by the US’s new, looser rules is Argentina. Uh oh. The MPs went a rather greeny-grey tinge. The tension was relieved only when Ann Clwyd’s mobile trilled into life at high volume with a Gangnam-style ringtone. Clwyd (Lab, Cynon Valley) didn’t know how to turn the device off and had to leave the room to take the call. Good to see the arms trade being scrutinised by such tech-savvy legislators. The meeting was not just about multi-million pound weapon systems. The committee heard about the enthusiastic exporting of machetes, police whips, handcuffs and sjambok-style truncheons to troubled countries, where, presumably, democracy-hungry protestors can draw comfort from being gored, whacked and manacled by “goods” made in Blighty. Surprise, surprise, the kingdom of GCHQ (and, er, the late News of the World) is also a world-leader in producing “anti-privacy equipment” as Stanley put it. Isbister flourished statistics about how arms licences to the Middle East recently have, er, rocketed and now form half our arms exports. Perhaps it is no wonder the government was so keen to life the arms embargo on Syria and why it has given “priority market” status to Libya, despite that country’s alarming political instability. Mike Gapes (Lab, Ilford South) had unearthed statistics on gun exports. These included 24,000 assault rifles, 9,000 rifles, 1,000 “super rifles” and 3,000 “sporting guns” to places such as Sri Lanka, the Seychelles and the Maldives. I say, Jeeves: how is the grouse shooting in the Maldives this season? These guns were exported without much paperwork because they were listed as being required for “anti-piracy” purposes. Gapes suggested that “some of these weapons might be diverted to othe5r purposes than anti-piracy”. Surely not! Sir Malcolm Bruce (Lib Dem, Gordon) said that some 40,000 firearms had been shipped from Britain under the anti-piracy label and wondered if “there is a danger a perfectly genuine concern about piracy could be a cover for getting more weapons” sold to foreign governments. Oliver Sprague from Amnesty International was worried that such weapons were often sold to countries where there was not much “human rights training”. Human rights training? Perhaps that can become the next growth area for British exports. With the Middle East now forming over half the market for British arms exports, this explains why David Cameron was so keen to boast about having sold ‘wonderful things’ to Saudi Arabia and places like it in his visit to the BAE plant in Wharton, Lancashire. This another political meme I found over on the Tumblr site, 1000 Natural Shocks. 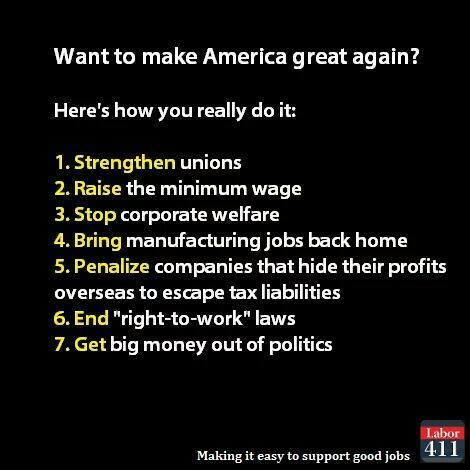 It advocates strengthening the unions, and giving working people jobs and a proper, living wage, to restore America’s place in the world. The meme may come from the other side of the Pond, but it equally applies over here in Britain as well. And, apart from the country, there’s not a word I’d change. Working people of all countries, unite! If you want to look at the original, be aware that it is an over 18 site. I’ve been following the campaign of the people involved in the 38 Degrees internet campaign group to hold demonstrations and protests in Bristol against the privatisation of the NHS. 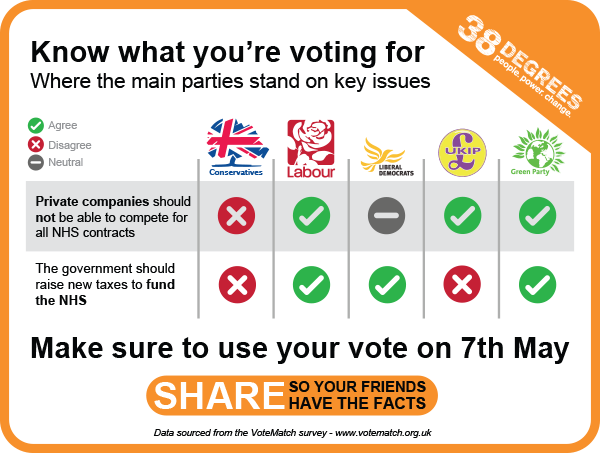 They’ve sent me this little infographic showing where the parties stand on allowing private companies to bid for NHS contracts, and funding it properly through higher taxes. Only the Greens and Labour wish to stop private companies bidding for NHS contracts, and fund it properly through higher taxation. Tellingly, UKIP wish to allow private companies into the NHS, while the Lib Dems say they’re neutral on it. The Tories claim they’re against, but frankly, I don’t believe a word of it. They’ve been privatising the NHS by stealth ever since they took power in 2010. Jeremy Hunt, one of the ministers or secretaries in charge, even said he stood in favour of its privatisation, while another Tory minister let the cat out the bag by saying that the if they won a second term, ‘The NHS as we know it would cease to exist’. The Tories then claimed he’d been misquoted, and that what he really said was that they would cut down on bureaucracy and cost. But this is the Tories, who lie as easily as most people breathe. Please bear all this in mind while voting tomorrow. And please feel free to share it, and help it spread to as many people as possible.